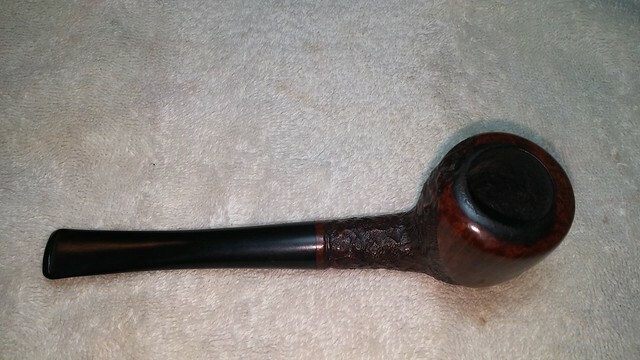 The next pipe from the estate sale that I chose to work on is a sandblast apple with a contrast black and brown stain. It is stamped on the underside of the shank in a smooth portion starting at the bottom of the bowl. It reads Iwan Ries over Black Knight. Next to that is the shape number 207 over Italy. Lastly there is a capital C. It is a Savinelli shape number. The finish was very dirty with dust and grime in the grooves and it seemed to be sticky. The cake in the bowl was quite thick and the lava had flowed over the rim top. The stem had a light IRC stamped on the left side of the taper and was lightly oxidized. The now characteristic tooth marks and chatter were on the top and underside of the stem near the button and the button surface itself had chatter and wear. The next four photos show the condition of the pipe when my brother Jeff brought it home from the sale and before he started to work on cleaning it up. He took a photo of the bowl from the top to show the cake in the bowl and the tarry build up on the rim top. The second photo below shows the sandblast on the left side of the bowl which is birdseye. The right side shows more of the ring grain but it will show up in later photos. The next photos show the clear and sharp stamping on the bottom of the bowl and the IRC stamp on the left side of the stem. It looks more deeply stamped than it appeared once it arrived in Vancouver. The stem shows the now characteristic tooth marks and chatter on both sides and the wear on the button surface as well, just as the rest of the pipes in the lot did. My brother scrubbed the bowl exterior with a tooth brush and Murphy’s Oil Soap to remove the sticky buildup and the grime in the grooves. He rinsed it with warm water to remove the soap and the dust. He reamed the bowl and scrubbed the rim top with the soap and tooth brush. He cleaned out the mortise and the airway in the shank and stem. He cleaned the stem with a short soak in Oxyclean. The soak brought the oxidation to the surface. I took the next four photos of the pipe when it arrived in Vancouver. The grain shows through the blast – birdseye on the left side and ring grain on the right side. I took a photo of the rim top and the inside of the bowl to show the condition. Like several other pipes in the estate lot this one still had raw briar at the bottom third of the bowl. The next two photos show the condition of the stem. The tooth marks and chatter are visible in the photo. The ones on the underside of the stem were deeper than the ones on the top side. I sanded the stem with 220 grit sandpaper to remove the tooth marks and chatter. I worked over the entire stem to break up the oxidation. I rubbed the bowl down with a light coat of olive oil on a soft towel. I took the following photos of the pipe after I had wiped it down. The shine on the sandblast revealed the contrast stains that had been used on the bowl – both a dark brown and black. I touched up the rim top with a dark brown stain pen to blend the rim into the rest of the bowl colour. The dark brown stain worked well on the high area and the black filled in the grooves of the blast. I set the bowl aside and worked on the stem. I wet sanded it with 1500-2400 grit micromesh sanding pads and gave it a rub down with Obsidian Oil. I dry sanded it with 3200-4000 grit pads and gave it another coat of oil. I let the oil dry and then buffed the stem with red Tripoli and Blue Diamond on the buffing wheel. I brought it back to the work table and finished polishing it with 6000-12000 grit micromesh pads. I gave it a final coat of Obsidian Oil and set it aside to dry. I put the stem back on the bowl and buffed the bowl lightly with Blue Diamond and more intently on the stem. The Blue Diamond polishes out the minute scratches in the vulcanite and gives the material more shine. I gave the stem multiple coats of carnauba wax and hand waxed the bowl with Conservator’s Wax. 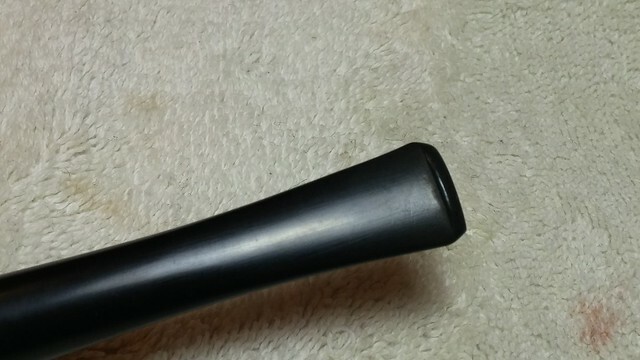 I buffed the pipe with a clean buffing pad to raise the shine. I hand buffed it with a microfibre cloth to deepen the shine. 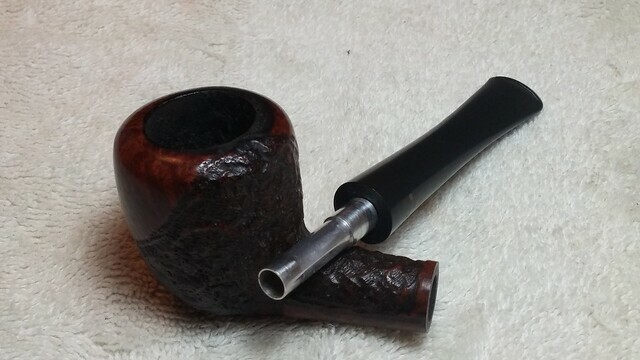 The finished pipe is shown in the photos below. The dimensions of the pipe are Length: 5 ¾ inches, Height: 1 1/8 inches, Outer diameter of the bowl: 1 ¼ inches, Chamber diameter: ¾ inches. The pipe is the kind of shape that feels great in the hand, it is light weight and comfortable. 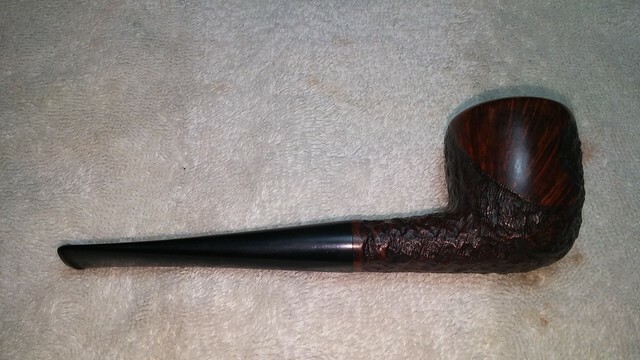 The look of the finished pipe is quite attractive and the contrast between the brown of the high spots on the briar and black in the crevices contrast well with the polished vulcanite stem. This one will soon be on the rebornpipes store. If you are interested in adding it to your rack email me at slaug@uniserve.com or send me a message on Facebook. Thanks for looking. This entry was posted in Pipe Refurbishing Essays and tagged bite marks, Bowl - finishing, buffing, contrast staining, finishing, Iwan Ries Black Knight 207 pipe, Iwan Ries Black Knight apple pipe, Iwan Ries Black Knight PIpes, micromesh sanding pads, Oxidation, pipe refurbishing, polishing, polishing a stem, polishing stems, refinishing, refurbishing, removing oxidation, removing tooth marks, restaining a bowl and rim, sanding a stem, Savinelli 207 Black Knight, Savinelli Pipes made for Iwan Ries, stem work, waxing a stem on June 2, 2017 by rebornpipes. Charles illustrates one method for handling fissures in the interior walls of the bowl. He does it very well. The Brigham Shape 18 Pear is quickly becoming one of my favourites; my very first pipe purchase back in university was a 2 Dot Pear, and it’s still in my rack and regular rotation. I’ve since added a 118, the restoration of which I’ve written about here, and now this 4-Dot version. The pipe arrived in good estate condition, like the rest of this estate lot. It showed rather well at first glance. There was a light crust of lava covering the right rear half of the smooth rim, which I hoped was not hiding any scorched briar underneath. There was a light cake in the bowl, but the stem was nearly pristine, showing only a light bit of tooth chatter. The exterior of the stummel was in great condition. This entry was posted in Pipe Refurbishing Essays on June 2, 2017 by rebornpipes. I am getting very close to finishing up the lot from the estate sale that my brother Jeff sent me for restoration. Because he had done a great job on the clean up the restoration of the lot has been a pretty easy process. I can’t tell you how much fun it is to work on clean pipes. Once I finish up this one I have only three left to complete. It is a good feeling when I get toward the end of a package of pipes. It feels like I actually am making some progress in the box of pipes to be restored sitting in my shop. This particular pipe is a beautiful Oom Paul with stunning grain all around the bowl. It is stamped Iwan Ries over Pantera on the left side of the shank with a faint IRC stamped on the left side of the saddle stem. It is stamped with the traditional Savinelli “S” shield with the shape number 614 over Italy on the right side of the shank. The underside has an upper case “C” next to the shank/stem junction. 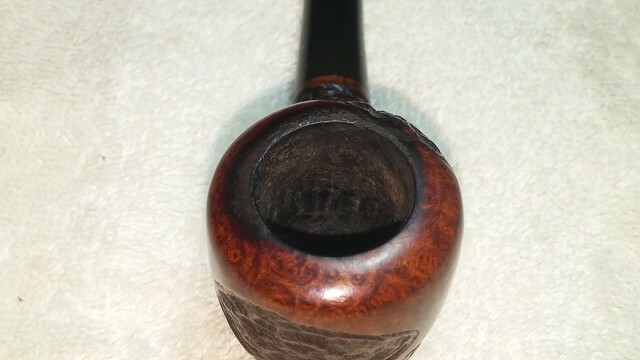 My brother took quite a few photos of the pipe from a variety of angles to show both the condition of the pipe and the beautiful grain around the bowl sides, top and bottom. The photos show the pipe before he started his clean up. The bowl was lightly cake and there was a light coat of lava overflowing on to the top of the rim. It appeared to be in excellent condition under the lava and both the inner and outer edges of the bowl were undamaged. The next three photos show the stamping that I noted above. It is readable and very clean and sharp. The IRC stamp on the stem was deep on the lower half and fainter as it moves toward the top. The next photos of the grain around the bowl show the cross grain and birdseye around the bowl sides, top and bottom. It really shows some spectacular grain. The stem was in very good condition in comparison to the other pipes in the estate. Even so, there were still some light tooth marks and chatter on both sides of the stem near the button and flowing onto the top and bottom of the button as well. My brother did his usual stellar job of cleaning up the pipe. The inside and outside were spotless when the pipe arrives. The stem was lightly oxidized as the Oxyclean treatment he gave it brought that to the surface. 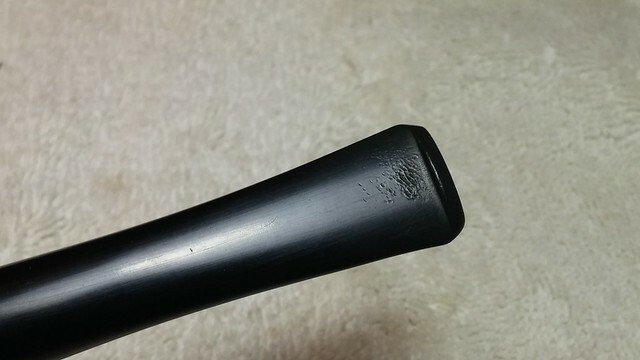 The next photos show the condition of the pipe when I brought it to my work table. The briar is beautiful with great grain. The stamping on the side of the saddle stem is faint and worn. The top of the rim and the bowl were very clean. Jeff had been able to remove the lava on the rim and had reamed the bowl back to bare briar. The bottom 1/3 of the bowl was undarkened and revealed that the bowl had not been smoked to the bottom. The oxidized stem shows the light tooth marks and chatter on both sides next to and on top of the button. They were the same characteristic marks that were on every other pipe in this estate lot. I sanded the stem surface and the top and underside of the button with 220 grit sandpaper to remove the oxidation and the tooth marks and chatter. It did not take too much work to remove the tooth chatter and marks as they were not deep in the vulcanite stem surface. The oxidation had come to the surface of the stem so it came off quite easily. With the tooth marks and chatter removed, I polished the stem with micromesh sanding pads – wet sanding with 1500-2400 grit pads and dry sanding with 3200-12000 grit pads. I worked over the stem with each of the grits of micromesh and between each one I rubbed the stem down with Obsidian Oil to enliven the rubber. I buffed the stem with red Tripoli on the buffing wheel after I had finished sanding it with the 4000 grit pad. I brought it back to the work table and finished polishing it with the 6000-12000 grit pads. I gave it a final coat of oil and set it aside to dry. I put the stem back on the bowl and buffed the stem and bowl with Blue Diamond on the buffing wheel. I worked it over until the minute scratches that were visible on the stem in the photos above were gone. The briar also began to shine with the buffing. I gave the pipe multiple coats of carnauba wax and buffed it with a clean buffing pad to raise the shine. I hand buffed it with a microfibre cloth to deepen the shine. 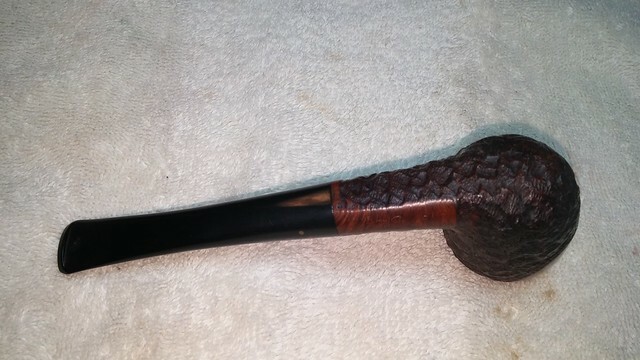 The finished pipe is shown in the photos below. This one has some remarkable grain and look. I will be putting it on the rebornpipes store shortly. It is available to add to your pipe collection if you want it. Just email me at slaug@uniserve.com or send me a message on Facebook. 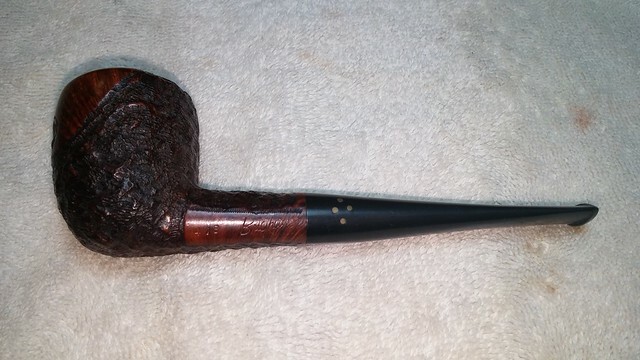 This entry was posted in Pipe Refurbishing Essays and tagged bite marks, finishing, IRC Pantera OomPaul Pipe, IRC Pantera Pipe, Iwan Ries OomPaul pipe, Iwan Ries Pantera 614, Iwan Ries Pantera Pipe, Iwan Ries Pipe made by Savinelli, Iwan Ries Pipes, micromesh sanding pads, Oxidation, pipe refurbishing, polishing, polishing a stem, polishing stems, refurbishing, removing oxidation, removing tooth marks, sanding a stem, Savinelli Pipe made for Iwan Ries, stem work, waxing, waxing a stem on June 2, 2017 by rebornpipes.